When you get involved in an accident, you may need the help of a power wheelchair to move around. Getting one approved by Medicare can be challenging. However, when you follow these steps you will not have a problem. • You have problems performing the daily activities at home• You cannot move around the home with the help of a cane, a walker or a manual wheelchair.• There is someone to get you on and off the wheelchair or help you operate it when you are unable. If you are eligible, your doctor will be able to determine the kind of mobility equipment you’ll need in your condition, your ability to operate it and usability at home. This will help Medicare see the need to approve it. Where to shop: Your doctor will fill out a certificate of medical necessity of a written order for you when it’s determine that you need a power wheelchair. After you have the written document, you can take it to a Medicare approved supplier like Towson Medical Equipment Company. You can search through the internet to know who is an approved supplier in your area. It is the duty of the supplier to send a representative so that he/she can assess your home, measure the doorways, thresholds and the overall space so that you will have an appropriate mobility device. Financial assistance: You will be in a better position when you have a Medicare supplemental policy. This will help have a Medicare approve your power wheelchair. In case you don’t have a supplemental insurance then you may be able to get help through a Medicare savings program. 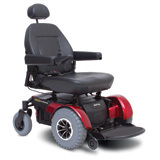 Getting a New Medicare Wheelchair is as easy as 1, 2, 3! Very important points here. When you have Medicare, there is usually a process to getting things like a power wheelchair. It’s crucial to know what steps to take. Thanks for sharing!